Insurgents launch what appear to be a highly co-ordinated string of attacks across Iraq, killing at least 55 on the deadliest day in nearly a month, and just a few days before the country's first election since the withdrawal of U.S. troops two years ago. 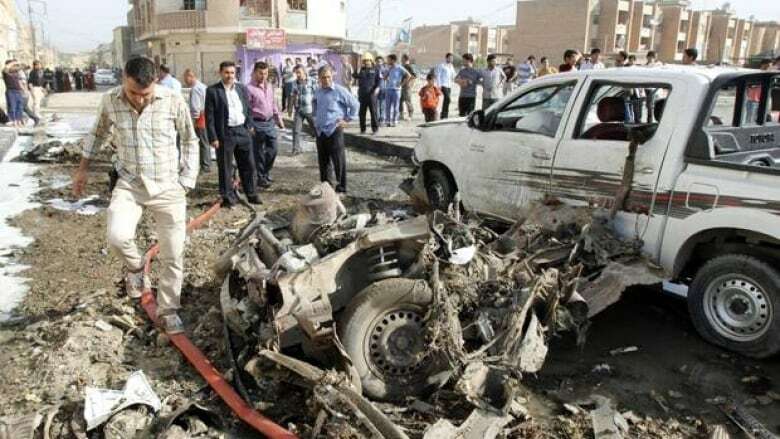 Insurgents in Iraq deployed a series of car bombs as part of highly co-ordinated attacks that cut across a wide swath of the country today, killing at least 55 on the deadliest day in nearly a month. The assault bore the hallmarks of a resurgent al-Qaeda in Iraq and appeared aimed at sowing fear days before the first elections since U.S. troops withdrew. There was no immediate claim of responsibility, but coordinated attacks are a favourite tactic of al-Qaeda's Iraq branch. Iraqi officials believe the insurgent group is growing stronger and increasingly co-ordinating with allies fighting to topple Syrian President Bashar al-Assad across the border. They say rising lawlessness on the Syria-Iraq frontier and cross-border cooperation with a Syrian group, the Nusra Front, has improved the militants' supply of weapons and foreign fighters. "Of course we are concerned about the violence in the country that has been increasing in the last weeks," UN envoy Martin Kobler told The Associated Press. He condemned the bloodshed and urged Iraqi officials to push ahead with the elections. "They should be free and fair, and every voter should go to the polls free of intimidation and fear," he said. Iraqi Army Maj.-Gen. Hassan al-Baydhani, the No. 2 official at Baghdad's military command, said authorities managed to defuse three car bombs in Baghdad before they could go off. "The terrorists want to grab headlines as we approach election day," he said. Monday's attacks — most of them car bombings — were unusually broad in scope. Among the places where attacks erupted were the Sunni-dominated western Anbar province and Saddam Hussein's hometown of Tikrit, the ethnically contested oil-rich city of Kirkuk and towns in the predominantly Shiite south. He described a chaotic scene where security forces opened fire into the air upon arrival to disperse onlookers as overturned vegetable carts sat stained with blood amid wrecked storefronts. Saad blamed politicians and security forces for lapses that led to the attacks, saying that elected officials "are doing nothing to help the people and are only looking out for their benefits." Two more car bombs exploded in a rare attack in a parking lot near the heavily guarded entrances to Baghdad International Airport. Three people were killed, including a bodyguard of a Shiite lawmaker whose convoy was passing by. The lawmaker escaped unharmed. "This attack and other attacks that took place today were part of the continuous efforts by al-Qaeda terrorists to shake the security and political situation ahead of the upcoming elections," said Diaa al-Asadi, a political ally of the lawmaker who was travelling in the convoy. Around sunset, a parked car bomb exploded near car dealerships in the eastern Habibiya neighborhood, killing 10. Other blasts struck the capital's Kamila, Karrada, Shurta, Baladiyat and Umm al-Maalif neighbourhoods. In and around the ethnically mixed northern city of Kirkuk, three parked car bombs went off downtown simultaneously — one in an Arab district, one in a Kurdish one, and one in a Turkomen district — killing four. Three other car bombs exploded outside the city, killing another five. Kirkuk, about 290 kilometres from Baghdad, is home to a mix of ethnic groups with competing claims to the oil-rich region. The day's mayhem began around 6:30 a.m. in the former insurgent stronghold of Fallujah when a suicide bomber drove an explosives-packed car into a police checkpoint, killing two policemen and wounding six others. Later in the day, two bodyguards assigned to a spokesman for anti-government protests that have raged for months were killed when a bomb attached to their car exploded on the highway between Ramadi and Fallujah. A similar bomb stuck to another car in the area killed two others. Another 15 people were killed and dozens were wounded in attacks in Baqouba, Buhriz, Khalis, Mosul, Mussayab, Nasiriyah, Rutba, Tarmiyah and Tikrit. Local police officials provided details of the attacks, and hospital officials confirmed the casualty tolls. The officials spoke on condition of anonymity because they weren't authorized to release details to reporters. The vote on Saturday will be the country's first since U.S. troops withdrew in December 2011. The election, for local-level officials, will be a test of the strength of Prime Minister Nouri al-Maliki's political bloc as well as the ability of security forces to keep the country safe. Monday's violence marked Iraq's deadliest day since March 19, the eve of the 10th anniversary of the U.S.-led invasion, when a wave of bombings killed 65 across the country.